Most modern musical instruments are derivations, developments and improvements from pre-existent models and archaic types. Very occasionally, a genuinely new instrument comes into being or is invented (Benjamin Franklin’s ‘harmonicon’, for example, which deployed a rack of tuned wine-glasses) that is completely original. A more recent unique innovation is the Steel Pan, originating in the Caribbean around the time of the Second World War. 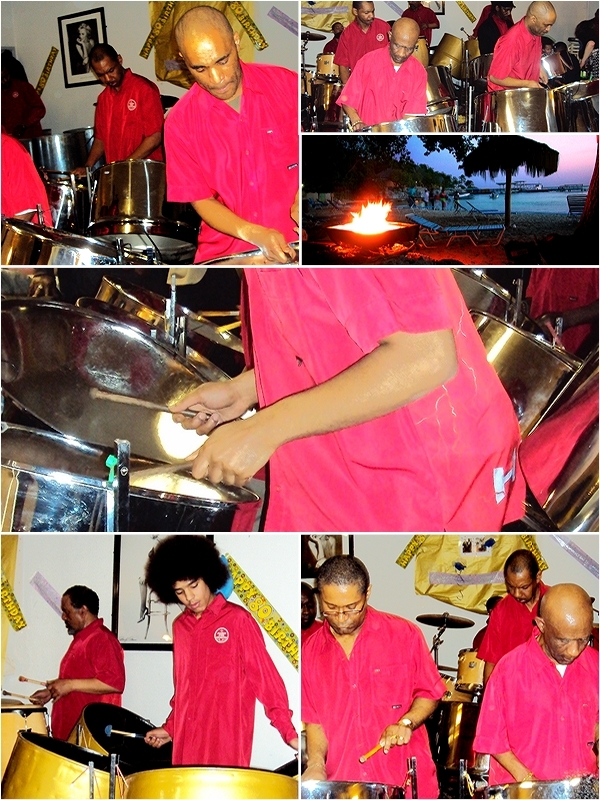 Find out more about booking Carribean steel bands for weddings and parties. Like Benjamin Franklin some 150 years earlier, the anonymous originators of the Steel Pan noticed that tins of varying sizes produced notes of different pitches when struck with a stick, and discovered that they could be tuned, much like a bell, by judicious cutting and panel-beating. Different zones or facets within the circular surface of the tin could be created to produce a variety of notes. When in 1941, after Pearl Harbor, the US entered the war, Roosevelt quickly set up a naval base on Trinidad. Oil in vast quantities was required for the war effort, and was transported to the island in large cylindrical corrugated steel containers. When empty, these oil drums were to provide the next inspiration for the emerging Steel Pan. At first, the islanders cut the empty containers in half for use as dustbins and barbecues etc. Then the more enterprising of the local musicians went one better, and requisitioned them to make musical instruments to play in their emerging Steel Pan Orchestras. Following the age-old principle that larger or longer instruments produce deeper pitches, different lengths of drum were cut to imitate different voices within the embryonic orchestra – much like the pipes of a church organ. The playing surface of each drum (especially the shallower, higher-pitched ones) was zoned or faceted to offer a choice of pitches, eventually resembling a kind of xylophone but with the notes in a circular arrangement. From these beginnings evolved the fully-fledged multi-voiced Steel Pan Orchestra we recognise today, with treble, alto, tenor and bass, as in the violin or recorder families. Empire Windrush and the Steel Pan invasion! From 1948 onwards, immigrants to Britain from the Caribbean islands arrived in large numbers, bringing much of their culture with them. The seductive, exotic uniqueness of the chiming, harmonious Steel Pan sound became synonymous with the West Indian musical culture of calypso, ska, soca and reggae, and is kept very much alive by the descendants of those original settlers in the UK. Caribbean Steel Bands bring a happy-go-lucky, sunshine carnival atmosphere to festivals, weddings, family parties and other social events the length and breadth of the British Isles.